Where do you get Food and Water? 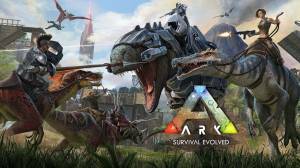 ARK: Survival Evolved is a RPG, survival and adventure game that was first launched back in 2015 for the PC. It has since been released on XOne and PlayStation 4 and is now available on Android and iOS. The game itself challenges you to survive on a prehistoric island with nothing but your underpants and a strange implant embedded in your arm. Your survivor will be able to build a base, join a tribe and even have a pet dinosaur as you seek to uncover the island’s secrets. Blueprints are found by either giving artifacts to an Obelisk as Tribute, or completing Pursuits. How do you Craft and make things? Where should I build a base? How do you Tame a Dinosaur? How do you Hatch Eggs? Where are the Respawn Points? When should I play Online? What is a Primal Pass?